Contrasting stories surround two of British boxing’s favourite sons this week. Firstly, and most satisfactorily, is Ian McNeily’s piece at BoxRec News dutifully reporting Ricky Hatton difficulty in summoning the will to commence training while the same site also records a summer fixture for Danny Williams on the other side of the world. News of this proposed clash comes just days after the genial Londoner promised retirement in the aftermath of his capitulation to Derek Chisora. Despite their polar positions, the reports are both grounded in common sense. Hatton’s in his affluence and knowledge that weight, mileage and motivation are all issues which would hinder his chance of redemption in any return. He will also be hostage to uncertainty in a sport where self-belief is an absolute. Should he elect to fight on and find himself walking to the ring a shadow of the fighter – both physically and mentally – who arguably peaked before the Kostya Tsyzu fight it will be a terrifying place to be for even a fighter of Hatton’s courage and experience. It could be as late as the first punch he’s hit by before he realises the game is up. And were that moment to occur against a heavy hitter, Ricky’s pride and hide could expose him to more damage than the swift knockout to Manny Pacquiao ever could. Were this watershed moment to happen against an opponent of limited renown it could undermine all the critical credit he worked so hard to accumulate. Two losses to pound for pound number one’s is defendable, add a third defeat to a veteran Erik Morales or a relentless Michael Katsidis and he could scupper his reputation in one fight. Williams meanwhile acknowledges the glaringly obvious answers to the very questions Ricky is reluctant to pose of himself. Williams’, in typically candid self-analysis, recognises he is worn out or to use the boxing parlance – shot. 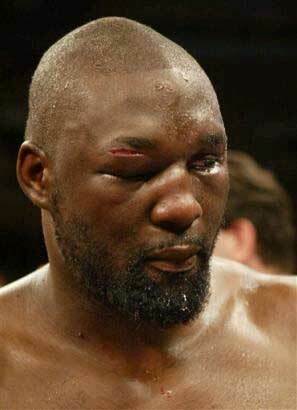 His recent fight with Chisora a grainy facsimile of his once formidable, if enigmatic best. He talked the talk, but the eyes were furtive, the quips clichéd and hackneyed. Everyone knew it was a farewell payday. One forged in the generosity of the British Boxing Board of Control, who opted not to strip him when beaten by Carl Baker in Prizefighter and allowed him to carry the British Heavyweight belt for one last hurrah. Though there was nothing but an unashamed fall-over to squeeze from the last dance rather than any hurrah. However, despite the loss of all his physical faculties of reflex, balance and durability and the mental essentials of desire and commitment he will likely come to precious little harm away from home to an Australian prospect. Take a few lumps and then opt to remain seated when eventually cuffed to the canvas. His great nemesis Julius Francis made a semi-lucrative career around Europe with just such an act. Here is where the common sense comes in. If Danny can sell his name for £20k purses around the globe for another 5-10 fights without facing a notorious puncher he can stay safe and eek out a nice pension pot to add to the wedge his roller-coaster career has earned him. He knows enough to navigate those types of waters. Sad though it will be to witness. Of course, Danny must be willing to swallow his previously gargantuan pride to do it without risk but on the evidence of the Chisora fight – he may well be at ease with that sacrifice already. Old? Check. Fat? Check. Unambitious? Check. Brian Nielsen next for Vitaly?